Print your logo onto these custom printed glassy stickers or one of our other innovative mail out tattoos & stickers and use them in your next marketing campaign as a unique giveaway item. Our promotional glassy stickers are a great, low cost way to market your logo. 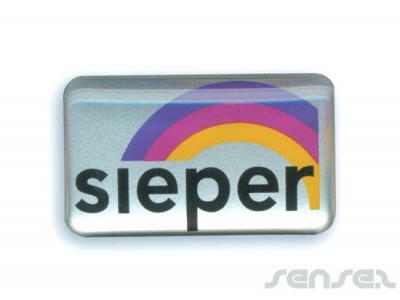 Glassy finished sticker or magnet with a soft feel. The epoxy finish over a full colour artwork, leaves a quality high tech image. Your custom stickers will surely have your audience sticking around for a long time. Other innovative corporate gift ideas that could be suitable to create brand awareness include these cheap promotional Vinyl Stickers (50x210mm), quirky advertising gifts such as these Vinyl Stickers (75x210mm) or how about using one of our more bespoke custom made products such as these great quality Mini Temporary Tattoos (3x3cm)? Custom brand these tattoo advertising flyers or one of our best-selling promotional mail outs or magazine inserts»mail out tattoos & stickers with your company logo! 4 colour process print is like a photographic print, where you can see a lot of detail and shading as part of your design. When we print your promotional glassy stickers in full colour process we usually do this as a digital print. The colour match is quite good but is never quite such a perfect PMS colour match as is achieved by silkscreen print. Personalise your glassy stickers or custom design mail out tattoos & stickers for your marketing campaign. How can these unique promotional glassy stickers or our personalised mail out tattoos & stickers fit in with your marketing strategy and help you maximise your brand exposure? Our custom made Glassy Stickers can be produced from a minimum quantity of 1000 pieces. We can have your logo branded on these corporate Glassy Stickers in Clear Epoxy Finish or 4 Colour Process Print. A setup fee of AU$280.00 will apply to make the film.